How to hook up the scope is different in Water Immersion Technique as well. Ordinarily, shortening is done by matching the bend of the scope to the flexure of the intestine ('the bend hooking'), however, in Water Immersion Technique, applying the tip of the scope to the intestinal wall and withdrawing the shaft of the scope is 'the tip hooking.' The bend hooking can hook with complete up-angle (180 degree up-angle) that can produce a very firm hooking, while the tip hooking hooks on the intestinal fold with the attachment on the tip of the scope at about a 90 degree angle, that can only make a less firm hooking. 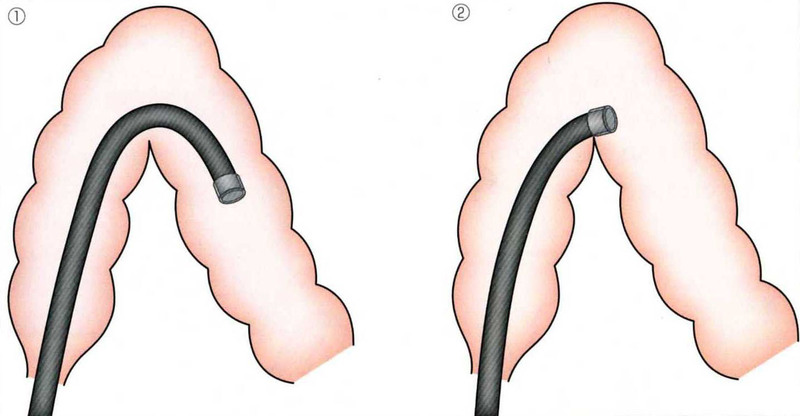 But in Water Immersion Technique, the colon is deflated and is not so shortening-resistant that even with the weak hooking the tip of the scope will not slip off the fold, resulting in a shortened colon. 1. Conventional hooking uses the bend part of the scope. 2. The tip hooking uses the attachment on the tip of the scope. [INSET 6-1] WHAT IS THE TIP HOOKING FOR EARLY SHORTENING? During Water Immersion Technique, hooking is different from conventional methods. One of the benefits of Water Immersion Technique is that even the weak hooking of the tip can hold the scope. 1. Conventional bending part hooking: match the bending part of the scope to the flexure of the intestine. The angle is full-up (180 degree). Holding is firm. 2. The tip hooking in Water Immersion Technique: touch the tip of the scope on the wall of the flexure of intestine. The angle is 90-degree up. Holding power is weaker than the conventional hook. It hooks at the attachment part and shortens it. The colon model is a model for air insufflation method, thus it is shortening-resistant. It is impossible to do the tip hooking for early shortening in the former half of the sigmoid colon, however, it is possible to practice the tip hooking of the pull method (at the S-top) and the push method (at SD). In the conventional pull method, you should pass the S-top once and match the bending part of the scope to the S-top and pull, but in the pull method with the tip hooking you are to touch the attachment to the S-top and pull. In the conventional push method, you should pass SD first and match the bending part of the scope to SD and pull, but in the push method with the tip hooking you are to touch the attachment to SD and pull. This is the push method where the scope is pushed up to SD, but the tip of the scope does not pass SD, only to hook at SD and shorten the intestine. In the push method you can practice with SD and in the pull method you can practice in the top of S.
Let's practice with SD by push method first. I will push the tip closer to SD first. I will start pulling from here attaching the attachment. It is shortening of the tip hook to shorten. This is the pull method where the scope is pushed up to the S-top, but the tip of the scope does not pass the S-top, only to hook at the S-top and shorten the intestine. You can practice at the top of S with pull method. Now, the top of S approaches. It starts to draw after attaching the attachment. After that I continue to pull the SD and over. I try to go beyond pulling strongly. I made it straight with a pull. During Water Immersion Technique, both early shortening and the tip hooking are used, but do not mix them up. The tip hooking is where of the scope is used for hooking and the early shortening is where in the colon the shortening is started. That is, with Water Immersion Technique, the tip attachment is touched at the bend or intestinal wall (the tip hooking) and shortening is achieved in the former half of the sigmoid colon or the former half of the transverse colon (early shortening). "Early shortening" is about where in the colon shortening is started. "The tip hooking" is about where of the scope is used for hooking.